Some people perceive scalp micropigmentation as an alternative to a hair transplant procedure. The patient in the photos below felt distraught by his hairline and temple recession. He felt that he could rely on SMP to make his hair loss less apparent. However, the presence of his existing hair exacerbated the effect, since it was quite obvious that he tried to use ink to compensate for his baldness. In realizing the mistake that he made with his choice to undergo SMP, the patient decided to make the needed corrections through Follicular Unit Extraction. This method, of course does not leave a linear scar. Therefore, the patient is able to wear his hair as short as he would like. 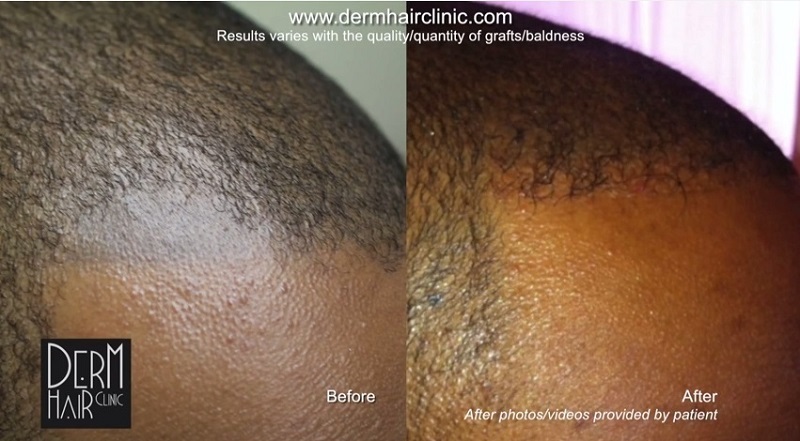 It is recommended that individuals of African origin who wish to undergo a hair transplant through Follicular Unit Extraction have a preliminary test performed first. This would be done by extracting hair follicles from a discrete and unnoticeable area to determine an approximate transection rate of the grafts. Hair follicles in black patients tend to have a curved shape. Yet general FUE punches are designed in a way that is more ideally suited for straight follicles which grow close to ninety degrees. Therefore, the structural deviations displayed in patients of African descent create a greater risk of damage through surgical instruments. Also, in some individuals, the tissue around the follicles may be thicker and more densely packed. This can present a challenge for punch excisions. However, this can be ascertained through a test procedure. The patient in the photos below qualified for a full surgery. 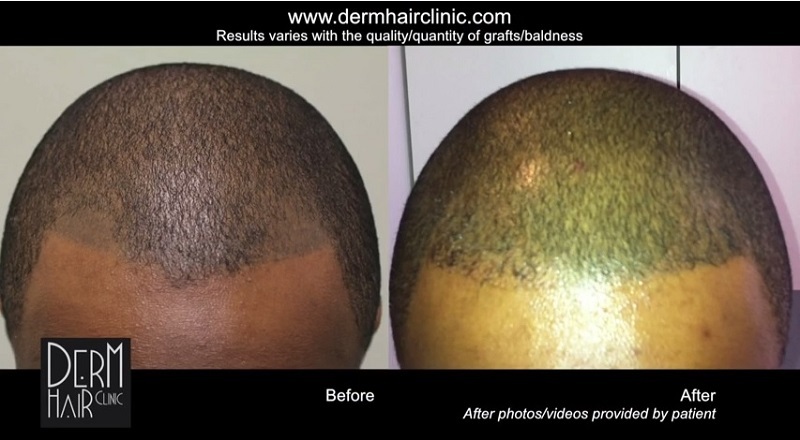 750 grafts were extracted using the specialized features of uGraft and inserted to cover the pigmented areas on his head. In the end, the hair transplant produced an excellent restoration of the hairline and temples, making his SMP experience a thing of the past. Here is the link to the patient’s video along with more information. Click here. The name of the clinic who performed the SMP would be really valuable information to the community. The problem is not with SMP, I think SMP can work well for some people, the problem here is that they were trying to use SMP to blend in with the patient’s own hair, that’s not what SMP is supposed to do. Absolutely spot on. The only way this could have worked out is if the patient shaved with a zero guard daily or every other day depending on the rate of his hair growth. The work would have had to be blended well into his existing has as well. Whoever sold him this tattoo must be very inexperienced and clueless about hair loss. My instinct is that it was a woman who sold him this, women usually have very different perception about hair loss and what is considered natural looking for a men with receding hairline.